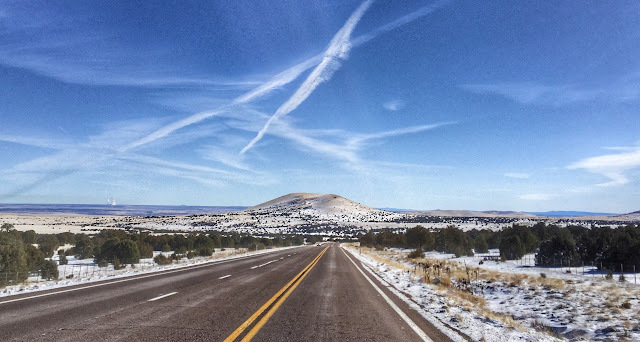 By the time we departed from the hotel in Show Low around 9:30 this morning, local traffic had rendered the roads slushy though the temperature had yet to reach 20°. Continuing east on US-60, the amount of snowfall diminished as we approached the boundary with New Mexico. As we passed through Springerville (pop. 1,967), the last town of any size for the next 150 miles, we checked our fuel level and made a pit stop at the local McDonald's. A few miles further we paused at the Becker Lake Wildlife Area and walked through a muddy field in search of a letterbox. We had no luck with the box and returned to the car with nothing to show for our efforts but a thick coating of sludge on the soles of our boots. We've been trying to plant at least one letterbox in each state we're visiting on this trip. 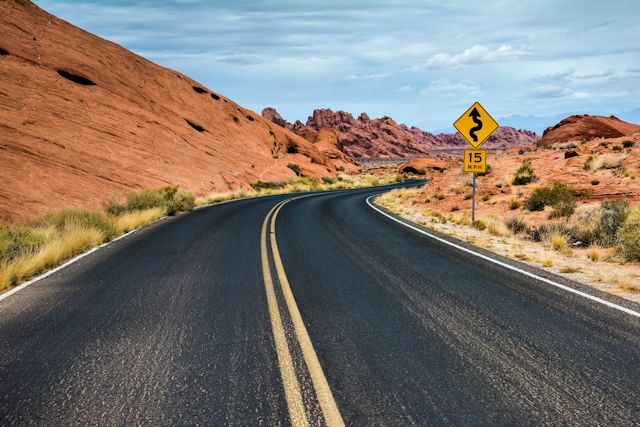 Somehow we missed Arizona on the way west, and after driving all the way across the state again, we found ourselves 14 miles from the border with the task still undone. Just as we were about to give up on the mission, we chanced upon a scenic vista pullout with a panoramic view of Escudilla Mountain, the third highest peak in the state, surrounded by the Valle Redondo. We knew we'd found the right place and promptly hid the box in a rocky crevice behind the interpretive sign. Crossing into New Mexico, we blinked through tiny Quemado (pop. 228), but, twenty miles further east, Pie Town (pop. 186) got our attention. 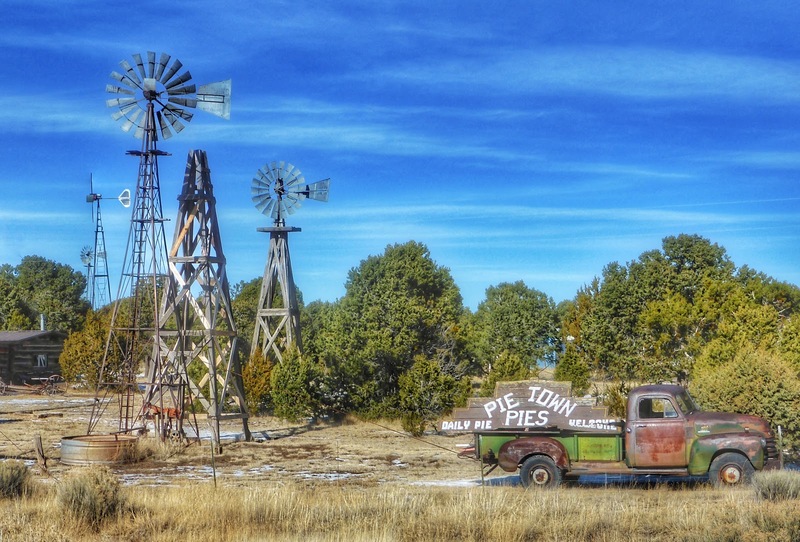 As a sign indicated, the town got its name from a bakery established in the 1920s that specialized in dried-apple pies. 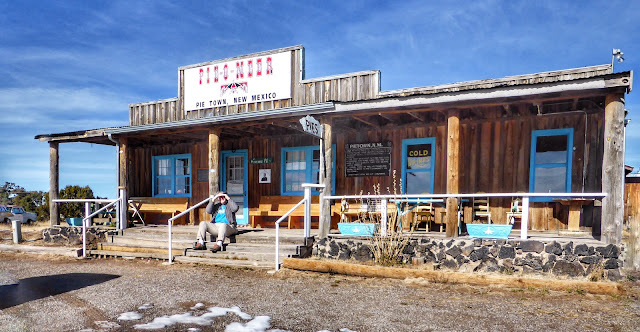 We stopped at the Pie-o-neer Cafe hoping to sample the latest version of Pie Town pie, but it was closed. According to the local guy sitting on the front steps, it won't reopen until March 14—on Pi Day, of course. He said he was meeting friends there, not waiting for pie, and informed us when he saw our Georgia license plate, that he had attended Emory University. "Bye, y'all," he called when we drove off. 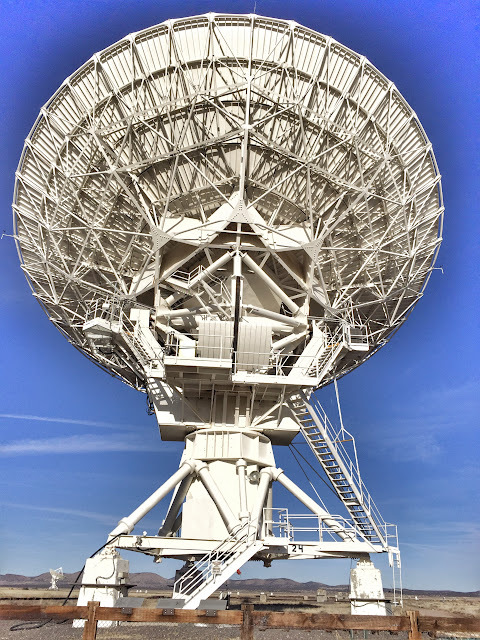 Another 35 miles along US-60 took us to the Plains of San Agustin and the Very Large Array (VLA). We were on the trail of a letterbox hidden close to the entrance road for the VLA Visitor Center. If we were movie goers, we'd have recognized this ground-based telescope as the place where Jodie Foster first heard signals from outer space in the 1997 film Contact. KEN POSES BY AN ANTENNA FOR SCALE. After stamping into the letterbox, we made our way to the visitor center to learn more about this fascinating facility. 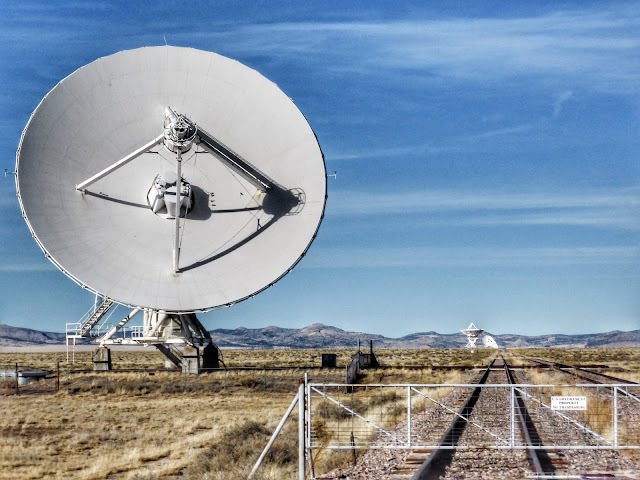 Back in 1956, a group of universities partnered with the National Science Foundation to establish and maintain an observatory for the purpose of radio astronomy research. The VLA is a radio telescope system that collects and processes data from 27 dish antennas to create detailed images of distant astronomical objects. 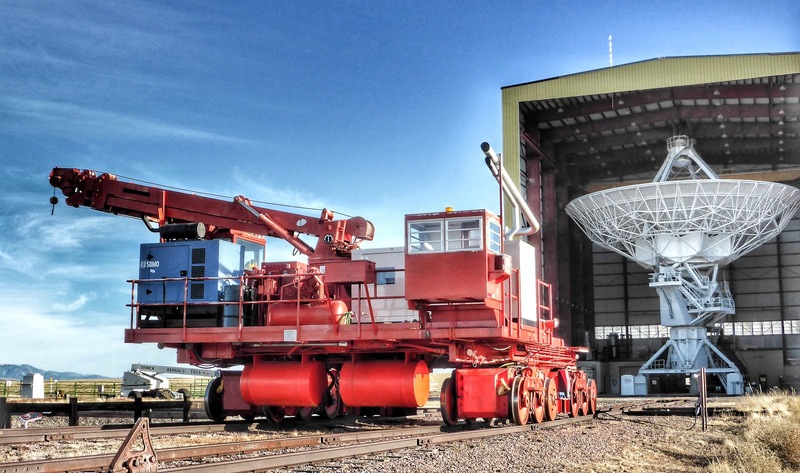 The antennas are 82-feet in diameter, and their configuration is changed quarterly by dragging them on rail tracks to different positions. Currently the dishes are at the maximum distance apart covering a span of 22 miles. In the tightest formation, they are all within a half mile. These different positions have the effect of making the entire system "zoom" to produce images with varying degrees of detail and scope. The VLA sits in the Plains of San Agustin, a dried-up ancient lake bed. With a 55-mile flat stretch, the plains offer the perfect site for the array and its system of rail tracks. Isolated from human development, the location also eliminates interference from radio and television signals. 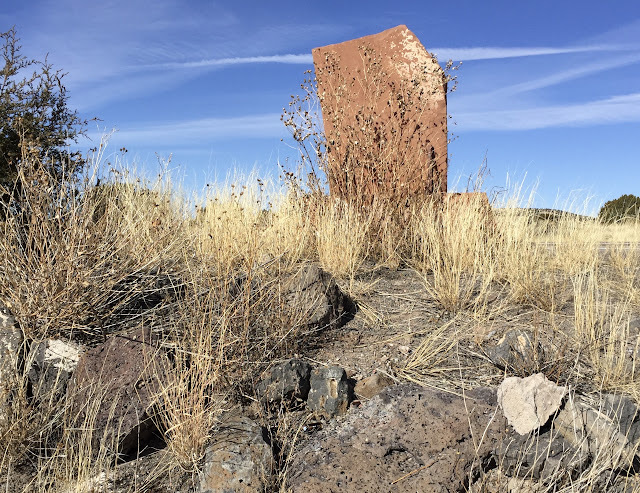 Thankful to letterboxing for taking us to another fascinating destination (though we probably would have noticed this one on our own), we returned to US-60 and made our way to Socorro by 5:15. 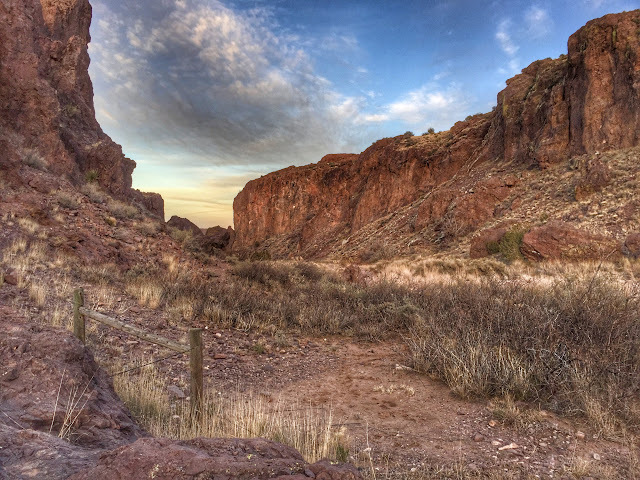 A few miles east of town, we realized that we had enough daylight left to find another letterbox at the Box Recreation Area, a rugged box canyon popular with rock climbers. It's not often that we see signs pointing out the side road leading toward "The Box" when we're searching for letterboxes. When we arrived at the end of the road, the letterbox wasn't the only treasure we found. The scenery was breath-taking. 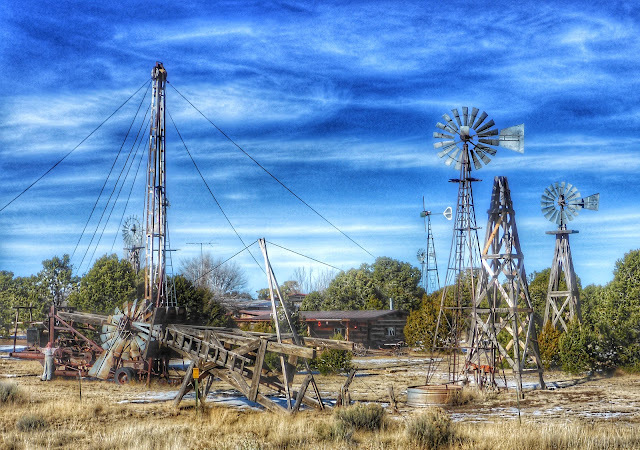 Tomorrow we have our sights set on Roswell, popularly known as the location of a 1947 UFO crash site. Today's unexpected visit to the VLA was a good stepping stone to further space exploration. 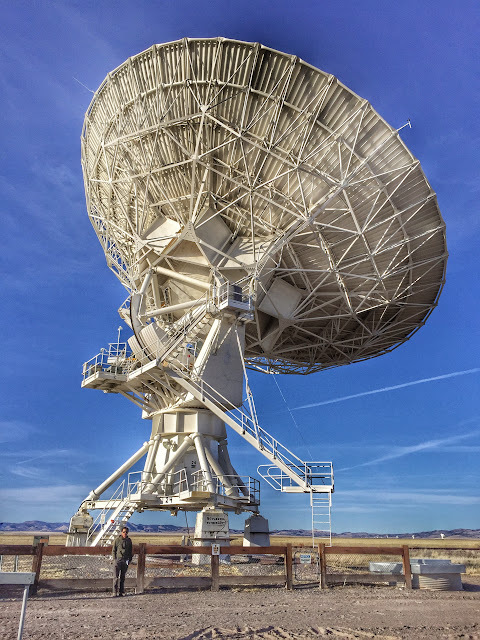 Loved: We were surprised how much we enjoyed our visit to the VLA. Learned: That 27 antennas can work together as one telescope and that radio waves can be converted to images. SCIENTISTS THE WORLD OVER USE DATA FROM THE VLA TO STUDY SPACE.